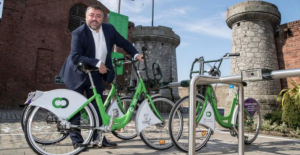 The 100th citybike docking station has been installed in Liverpool within the Titanic Hotel’s car park, in the World Heritage listed Stanley Dock. The new station, which can hold 10 bikes, connects the district to a network of stations across Liverpool, with the scheme now offering 500 bikes. Situated near to the Regent Road entrance the Ten Streets creativity district, the citybike station provides easy access to the city centre. The Regent Road area is undergoing a multi-million pound revamp and will boast a new cycle lane, which will eventually connect up a 20-mile route from Otterspool, in the south of the city, to Ainsdale in Sefton. The works are one of the city council’s key highways schemes as part of a wider £500m investment drive to improve Liverpool’s roads. The bike hire scheme was launched in Liverpool in 2014 by Hourbike but was brought in-house by the council and rebranded citybike last year.